Celebrity magazine Now is to close its print run, with the last issue of the magazine going on sale on Wednesday. Angie O’Farrell of TI Media, which owns the title, cited “the changing dynamics of the celebrity market”. “Consumers [are] increasingly getting their fix of celeb news and gossip from other sources that can break stories immediately,” she said. The celebsnow.co.uk website will continue. A consultation with staff is still ongoing. 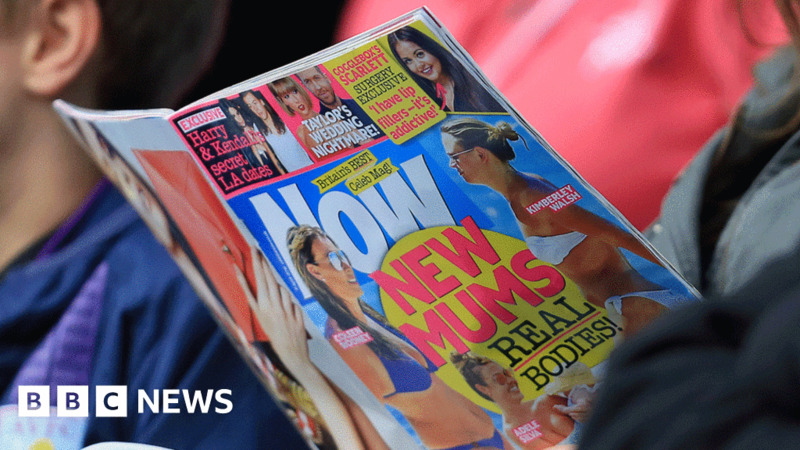 The news of Now’s closure follows a slew of magazine cuts following pressure from the online market and a drop in advertising revenue. Men’s magazine Shortlist was axed last year, as was NME which, after more than 60 years in print, shifted complete focus to its online presence. Several so-called ‘lads’ magazines were axed in 2014 and 2015, including Nuts, Zoo, FHM and Loaded. The phrases were taken from social media comments about the presenter and put alongside a picture of Solomon in a bikini, which she had shared herself on social media to encourage body positivity. Solomon herself hit out at gossip magazines for making women feel as though “they’re not good enough”.